University can be difficult for everyone, however, students who have learning difficulties, such as dyslexia, face more challenges than most. Dyslexia can cause difficulty with reading, interpreting words and processing information, as well as problems with expressing ideas clearly and organisation. – Specialist study skills tutors for one-to-one sessions to help improve study skills. How has dyslexia impacted you? University can be difficult as I struggle to concentrate for long periods of time and find it difficult to take notes during lectures. I also have to spend longer than other students when reading class materials, re-reading them until I fully understand, and it takes me longer to understand assignments and check that I have completed all the work. It can be hard to communicate with others, people can take things differently to how it’s meant, but I don’t always understand what is wrong with what I’ve said. This can make it difficult when working with others. Emailing lecturers is also hard due to problems with spelling. How has the support offered by the university and the DSA helped you? The Student Support team gave me information about the DSA. The DSA gave me funding for one-to-one sessions, a new laptop and software to help me take notes and write reports. This has helped me to overcome some of the difficulties [having dyslexia brings]. The biggest help has been having a scribe and my own room during exams. This helps with my concentration and means I don’t have to worry about my spelling and punctuation. 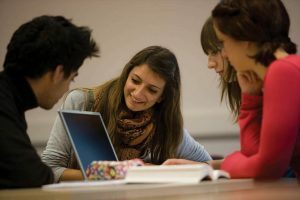 What advice would you give to other students with dyslexia coming to university? Apply early for support so you get what you need as soon as possible, and don’t be afraid to let lecturers and classmates know that you have dyslexia so they can start to understand the problems you might have. If you have dyslexia or think you might have dyslexia register with the Student Support and Wellbeing team to arrange support or a screening. Find out more about the support available to you here.